See more on coho and copper on NOAA's web page - be sure to watch the video! Baker, R. J., M. D. Knittel, and J. L. Freyer. 1983. Susceptibility of chinook salmon, Oncorhynchus and tshawytscha (Walbaum), and rainbow trout, Salmo gairdneri Richardshon, to infection with Vibrio anguillarum following sublethal copper exposure. Journal of Fish Diseases. 6:267-275. Baldwin, D. H., J. F. Sandahl, J. S. Labenia, and N. L. Scholz. 2003. Sublethal effects of copper on coho salmon: Impacts on nonoverlapping receptor pathways in the peripheral olfactory nervous system. Environmental Toxicology and Chemistry, 22(10):2266-2274. Boone Kaufman, J., R. L. Beschta, N. Otting, and D. Lytjen. 1997. An ecological perspective of riparian and stream restoration in the Western United States. Fisheries. Special Issue on Watershed Restoration. 22(5):12-24. Toxicities of cadmium, copper, and zinc to four juvenile stages of chinook salmon and steelhead. Trans. Am. Fish. Soc. 107(6):841-847. Paul M. Craig,* Chris M. Wood, and Grant B. Mcclelland 2010. 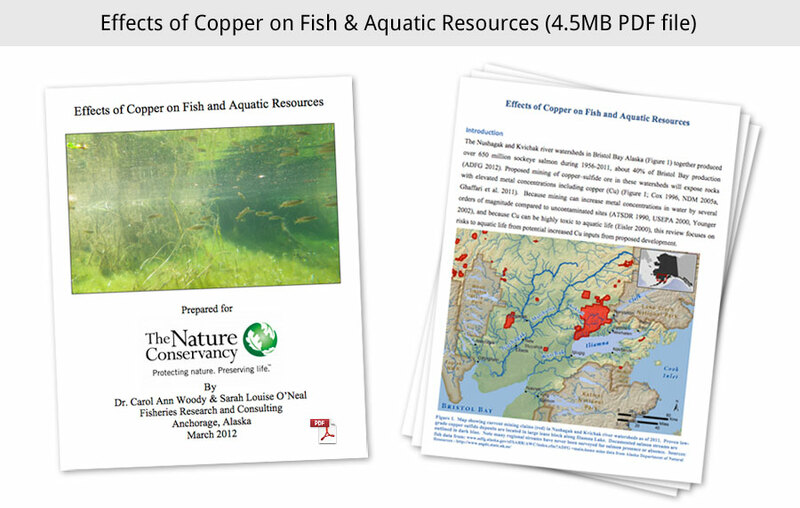 Copper hazards to fish, wildlife, and invertebrates: A synoptic review. Patuxent Wildlife Research Center, U. S. Geological Survey. Biological Science Report USGS/BRD/BSR--1997-0002, Contaminant Hazard Reviews Report No. 33. Farag, A. M., D. F. Woodward, W. BruMBaugh, J. N. Goldstein, E. MacConnell, C. Hogstrand, and F. T. Barrows. 1999. Dietary effects of metals-contaminated invertebrates from the Coeur d'Alene River, Idaho, on cutthroat trout. Trans. Amer. Fish. Soc. 128:578-592. Feris, K., P. Ramsey, C. Frazar, J. N. Moore, J. E. Gannon, and W. E. Holben. 2003. Differences in hyporheic-zone microbial community structure along a hevy-metal contamination gradient. Applied and Environmental Microbiology. 69(9):5563-5573. Hecht, S. A., D. H. Baldwin, C. A. Mebane, T. Hawkes, S. J. Gross, and N. L. Scholz. 2007. An overview of sensory effects on juvenile salmonids exposed to dissolved copper: Applying a benchmark concentration approach to evaluate sublethal neurobehavioral toxicity. U.S. Dept. Commer., NOAA Tech. Memo. NMFS-NWFSC-83, 39 p.
Thomas H. Hutchinson, John Solbe and Pamela J. Kloepper-Sams 1997. Analysis of the ecetoc aquatic toxicity (eat) database III - comparative toxicity of chemical substances to different life stages of aquatic organisms. Collins Kamunde, Ruth MacPhail 2011. Metal–metal interactions of dietary cadmium, copper and zinc in rainbow trout, Oncorhynchus mykiss. Tiffany L. Linbo, David H. Baldwin, Jenifer K. Mcintyre,and Nathaniel L. Scholz 2009. Effects of water hardness, alkalinity, and dissolved organic Carbon on the toxicity of copper to the lateral line of Developing fish. Lundebye, A. K., M. H. G. Bernstssen, S. E. Wendelaar Bonga and A. Maage. 1999. Biochemical and physiological responses in Atlantic salmon (Salmo salar) following dietary exposure to copper and cadmium. Marine Pollution Bulletin. 39(1-12):137-144. J.C.A. Marr, J. Lipton, D. Cacela, J.A. Hansen, H.L. Bergman, J.S. Meyer, C. Hogstrand 1996. Relationship between copper exposure duration, tissue copper concentration, and rainbow trout growth. McIntyre, J. K., D. H. Baldwin, J. P. Meador, and N. L. Scholz. Chemosensory deprivation in juvenile coho salmon exposed to dissolved copper under varying water chemistry conditions. Environ. Sci. Technol. 42(4):1352-8. Jenifer K. Mcintyre, David H. Baldwin, David A. Beauchamp, and Nathaniel L. Scholz 2012. Low-level copper exposures increase visibility and vulnerability of juvenile coho salmon to cutthroat trout predators. Christopher A. Mebane and David L. Arthaud 2010. Extrapolating Growth Reductions in Fish to Changes in Population Extinction Risks: Copper and Chinook Salmon. Nagorski, S. A., J. N. Moore, and T. E. McKinnon. 2003. Geochemical response to variable streamflow conditions in contaminated and uncontaminated streams. Water Resources Research. 39(2), 1044, doi:10.1029/2001WR001247. Daniel Peplow, Robert Edmonds 2005. The effects of mine waste contamination at multiple levels of biological organization. Haifeng Qian, Jingjing Li, Liwei Sun,Wei Chen, G. Daniel Sheng,Weiping Liu, Zhengwei Fu 2009. CoMBined effect of copper and cadmium on Chlorella vulgaris growth and photosynthesis-related gene transcription. Keith B. Tierney, David H. Baldwin, Toshiaki J. Hara, Peter S. Rosse, Nathaniel L. Scholzb, Christopher J. Kennedy 2010. U.S. Environmental Protection Agency. 2007. Aquatic life aMBient freshwater quality criteria - copper. U.S. EPA. Washington, DC. 204 pp.